Dragonfly Fibers is an indie yarn company specializing in artisan dyed yarn. 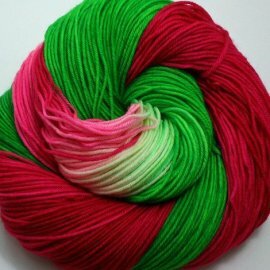 We dye high quality knitting yarns and spinning fibers in deep, rich and sometimes crazy bright colors for your crafting pleasure. The Colors of Happiness are created and shared with the world by Kate Chiocchio and the amazing Team Dragonfly - made up mostly of friends based in the Washington, DC area. Threads & Ewe is so excited to carry Kate's gorgeous yarns and exciting vibrant colors! !